At Yellingbo the Lowland Leadbeater’s Possum is found in similar habitat as the Helmeted Honeyeater. 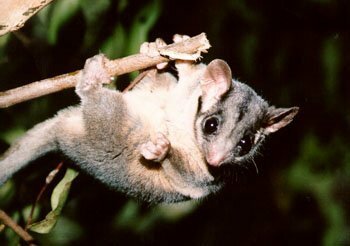 The Lowland Leadbeater’s Possum prefers habitat with dense midstorey of Melaleuca and Leptospermum, and inhabits the Mountain Swamp Gum.It is also an endangered species and is Victoria’s faunal emblem. Yellingbo Nature Conservation Reserve is the only place in the world where 3 of Victoria’s state emblems co-exist. The other faunal state emblem not found in Yellingbo? Weedy Seadragon. In 2012 Victoria declared a new state emblem. The mineral emblem, gold. The generic name Gymnobelideusmeans “naked dart” referring to the lack of a flying membrane, and the species name leadbeateri was named after J. Leadbeater who was the taxidermist at the National Museum of Victoria. Leadbeater’s possums are grey to greyish-brown above and paler below with a dark mid-dorsal (along centre of back) stripe. They have an average body length of 15-17cm and a total length (including the tail) of around 33cm. They weigh an average of 100 – 165 grams. It is recognised by its characteristic baseball bat shaped tail, which is narrower at the base. Leadbeater’s Possum are endemic to Victoria, existing nowhere else but the montane ash forests of the Central Highlands, alpine Snow Gum forests between Lake Mountain and Mt. Baw Baw and the Lowland Leadbeater,s Possum at Yellingbo Nature Conservation Reserve . Old hollow trees, dense midstorey of wattles in the ash forests and smooth barked gum trees with loose bark are indicative of the habitat. The small population at Yellingbo Nature Conservation Reserve is in a unique habitat as it is a low-lying Mountain Swamp Gum woodlands. What are the major threats to the Leadbeater’s Possum? The Leadbeater’s Possum is most threatened by habitat loss. This includes from industrial logging, salvage logging (logging trees, often those regenerating, after a bushfire), prescribed burns, clearing access roads for fire breaks, and the collapse of old hollow bearing trees. What is the status of the Leadbeater’s Possum? What are the breeding habits of the Leadbeater’s Possum? Leadbeater’s possums live in colonies of up to 12 animals but only one pair will breed. Breeding can occur twice a year (spring/summer & autumn/winter) with up to 2 joeys being born. Loose bark is wound into a round ball and is used for lining nests in old hollows, or, as in the case of Yellingbo, in nest boxes and sometimes in tree ferns. What do Leadbeater’s Possums eat? It is known to eat insects, such as moths, crickets and beetles, and spiders which it claws out from underneath tree bark, or finds hanging from bark strips. Some insects exude a sweet liquid called “honeydew”, which the Leadbeater’s possum licks off the leaves of trees. It enjoys the gum, nectar and sap of wattle trees and eucalyptus trees. At Yellingbo the Helmeted Honeyeaters like to feed on sap running from cuts in tree trunks made by the possums. Visit Friends of Leadbeater’s Possum website. Leadbeater’s Possum (LBP) first described from two specimens collected at the Bass River in south-west Gippsland. The first Helmeted Honeyeater was also described at the same time. LBP presumed to be extinct in the Bass River district owing to extensive vegetation clearance. LBP listed as “certainly, or almost certainly, extinct”. After 50 years without a confirmed sighting, LBP re-discovered by Eric Wilkinson near Marysville in the Montane ash forests of the Victorian Central Highlands. On 2nd March LBP became Victoria’s mammal faunal emblem. LBP first bred in captivity by naturalist Des Hackett. LBP discovered inhabiting lowland swamp forest at Yellingbo Nature Conservation Reserve by Ian Smales. Virginia Thomas conducts her honours thesis on LBPs at Yellingbo. David Lindenmayer collects blood samples from 11 LBPs at Yellingbo. Dan Harley commences a PhD investigating LBP’s life history, population dynamics and conservation at Yellingbo. Surveys for LBPs in lowland swamp forest at Bunyip State Park commence. The species is not detected. Parks Victoria initiate annual population monitoring of LBPs at Yellingbo. Two LBPs taken from Yellingbo for captive-breeding at Healesville Sanctuary. LBP detected at Buxton Silver Gum Reserve. Discovery of a single male LBP along the Woori Yallock Creek section of the reserve. Translocation occurs of a single female LBP to the Woori Yallock Creek section of the reserve. Birgita Hansen commences a PhD into LBP genetics (including approx 200 samples from Yellingbo). Five LBPs translocated to the Woori Yallock Creek in an attempt to establish three colonies. The effort is unsuccessful. Friends of Leadbeater’s Possum is formed. The last Leadbeater’s Possum held in captivity at Healesville Sanctuary dies (it originated from Yellingbo). Black Saturday bushfires destroy more than 40% of LBP habitat and population numbers in the wild are halved to an estimated 1000 individuals. The population of LBP at Yellingbo is found to be ‘genetically divergent’ to the highland populations confirming they are a naturally occurring population. There had previously been some uncertainty as to whether the population had been introduced. Melbourne Museum mounts a temporary display of LBPs, which includes the burnt remains of a nest box collected after the Black Saturday fires, reveals the efforts before and after Black Saturday to secure this significant animal. A new captive breeding program begins at Healesville Sanctuary. LBP’s from Yellingbo NCR are sourced as ‘founders’ for the program. 1000’s of years separation from the Central Highlands LBP population has meant the Yellingbo population (lowland LBP) is now known to be genetically distinct. Approximately 40 lowland LBP’s are known to remain in the wild – all at Yellingbo. Professor David Lindenmayer (ANU) calls on the Victorian Government to expand the current LBP Reserve System to include all LBP remaining habitat in the Central Highlands in a new Great Forest National Park.